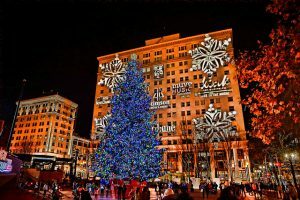 The day after Thanksgiving, November 23, marked the 34th annual Christmas Tree lighting in Portland’s Pioneer Square. The 75 foot tall tree was grown in Oregon, and was decorated with 14,000 lights. To heighten the mood of the festivity, Portland’s famed Pink Martini musical group lead tree lighting event attendees in a holiday sing-along. The Christmas Tree lighting kicks off the holiday shopping season in Portland — we wish our partners at the Portland Japanese Garden, Allport Editions, and Portland Gear the best of luck and success during this busy time of the year.